This offseason, MiLB.com will be honoring the players - regardless of age or prospect status - who had the best seasons in their organization. We're taking a look at each team to determine the outstanding seasons in Minor League baseball. Select a team from the dropdown below. Much like Arizona's season, the Diamondbacks' Minor League system struggled, with two clubs -- Double-A Mobile and Rookie-level Yakima -- reaching the postseason. Mobile fell in four games to Jacksonville in the Southern League semifinals, while Yakima finished in first place (25-13) before getting swept by Spokane in the first round of the Northwest League playoffs. Short-Season Missoula (14-23), Class A South Bend (59-78), Class A Advanced Visalia (72-68) and Triple-A Reno (69-74) finished near the bottom of their respective divisions. Catcher -- Konrad Schmidt, Mobile (107 games), Arizona (four games): Schmidt was so good he got the call to the Majors straight from Double-A. The 26-year-old posted impressive numbers, hitting .315 with 11 homers and 65 RBIs in 107 games (89 behind the plate) before earning a trip to Chase Field. Josh Ford (123 games at Visalia) also had a solid year in his comeback from Tommy John surgery, batting .273 with 19 homers and 77 RBIs. "It's Konrad Schmidt, hands down," said Mike Berger, the D-backs' director of player development. "He is wired the same way as Josh, but he's two years younger, made his way from Mobile to the big leagues. I think there's a separation between those two. [Ford] had a solid year and he's a great, great story." First baseman -- Paul Goldschmidt, Visalia (138 games): Goldschmidt emerged as one of the most promising prospects in the Arizona system this summer, posting huge numbers en route to winning California League MVP honors. The 2009 eighth-round pick was a two-time Player of the Week, also was named Cal League Rookie of the Year and led all Class A players with 35 homers. "He's our Player of the Year," Berger said. "It's his first full year out there and he wins Cal League MVP. He's shown a tremendous amount of power and hit for average." Goldschmidt batted .314 with 108 RBIs after hitting .334 with 18 homers and 62 RBIs in 74 games as a rookie in '09. The Texas native should continue to rake at Mobile -- and perhaps higher -- in 2011. "Power like that doesn't grow on trees," Berger said. "He hits to all three fields, he's certainly a Major League caliber-type prospect." Honorable mention: Brandon Allen, Yazy Arbelo. Second baseman -- Michael Freeman, Yakima (53 games): Freeman joined the D-backs out of Clemson and produced an impressive debut season, helping the Bears reach the playoffs and leading the team with a .333 average. "He is a very instinctive player, on both sides of the ball," Berger said. Freeman had 11 extra-base hits, 23 RBIs and was 20-for-23 in stolen bases. He batted .347 in August and ranked second among Diamondbacks prospects in overall average. "He definitely has a knack for hitting. He's an above-average second baseman, he's an average run guy but better-than-average basestealer," Berger said. "He's oozing with instincts and has a great feel for playing the game. He's down in instructs now and he's picked up where he left off." Third baseman -- Bobby Borchering, South Bend (135 games): The switch-hitter was the 16th overall pick in the 2009 Draft and looked the part in his first full season with 15 homers, 31 doubles and 74 RBIs for the Silver Hawks. He hit .270 and earned Midwest League Player of the Week honors on May 3 before batting .293 in August and .360 in September. "Borchering or Ryan Wheeler, take your pick," Berger said. "Borchering had a really nice year. At 19, this is a individual who profiles as somewhere in the middle of a Major League lineup in two or three years. It's tough to put a number on that, but he's a switch-hitter and down the road projects to hit in the middle of a Major League lineup. He's got loads of power, I think an increasing feel for hitting and understands the strike zone. He uses the whole field from both sides." Shortstop -- Zach Walters, Yakima (69 games): The D-backs selected Walters in the ninth round of June's Draft, and he quickly found his groove alongside Freeman in the Bears' infield. The University of San Diego product batted .302 with four homers, 43 RBIs and 83 hits in 69 Northwest League games. He hit .362 in August and was named a Northwest League All-Star. Berger was impressed, but disagreed with the pick. "Chris Owings is your guy. Hands down, he's an impact player," he said of the infielder who hit .298 with five homers and 28 RBIs in 62 games at South Bend. "Walters had a really nice year, but it's an apples-to-acorns comparison. Owings missed two months with plantar fasciitis, but he was probably one of the top two or three players in the entire league. Doing it at 18, he's an impact player on both sides of the ball. He's at instructs and it's going to be fun to watch him." Outfielders -- Collin Cowgill, Mobile (131 games): A two-time Southern League All-Star, Cowgill hit .302 with 16 homers, 83 RBIs and 25 steals in a balanced season at Double-A. He added 34 doubles and four triples while posting his best power numbers since the D-backs took him in the fifth round of the 2008 Draft. "Look at the outfield assists -- I think he had 25. He was a man on a mission," said Berger. "I think he's as complete a player as we have in the system and beats you with power, legs, arm and plays all three outfield positions. He'll start at Reno [next season], no doubt." 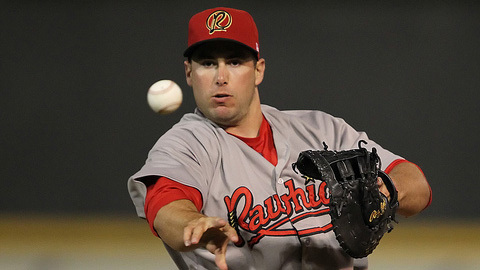 Marc Krauss, Visalia (138 games): He formed a powerful duo with Goldschmidt in the Rawhide lineup, hitting .302 with 25 homers and 87 RBIs in only his second season. The Ohio University product, who batted .304 in 32 games with South Bend last year, was the Cal League Player of the Week on July 6 and earned postseason All-Star honors. "All along, we felt he would hit for power and we had no doubts he'd hold an average too," Berger said. "He uses all three fields, power to both gaps. He was probably as consistent as we had in the organization from start to finish. He had a wonderful year." Doug Deeds, Reno (129 games): The 29-year-old, drafted in 2002, put together another solid season with a .302 average, a dozen homers, 55 RBIs, 39 doubles and 10 steals in his third straight summer at Triple-A. Deeds led Reno in average and hit .386 in his final 10 games, falling short of a September callup. "He had a great year," Berger said. "He had a year worthy of playing at the big league level. I think he has the ability to play at the next level." Berger also cited Adam Eaton, an All-Star who won the Pioneer League batting title by hitting .385 at Missoula. Designated hitter -- Matt Davidson, South Bend (113 games), Visalia (21 games): Davidson, a two-time All-Star in 2010, ripped apart the Midwest League with a .289 average, 16 homers and 79 RBIs in his first full season. The 2009 first-round pick saw time in the Cal League, where he added 11 RBIs to finish with 18 homers and 90 RBIs overall. Right-handed starting pitcher -- Charles Brewer, Visalia (14 games), South Bend (13 games): Brewer is an easy choice after leading the organization with 153 strikeouts and a 2.45 ERA, splitting his first full season between two Class A levels. "He earned his way out of South Bend, his numbers were off the charts," said Berger. The 2009 12th-round pick out of UCLA also dominated the hitter-friendly Cal League. "He's another guy from Opening Day to the end, I think [he] had one hiccup in his first or second start, had his clock handed to him. We laughed -- he needed it -- and then he got back on the horse and never skipped a beat," Berger said. "He'll start at Mobile. I have every reason to believe he's pitched himself to the next level." Left-handed starting pitcher -- Wade Miley, Visalia (14 games), Mobile (13 games): Miley, a 2008 first-round pick, owned the second-lowest ERA in the system (2.65) and saw success at two levels. "He was our Minor League Pitcher of the Year and that was as tough a decision as you'll make," Berger said. Miley's numbers after being moved up to Double-A actually improved -- he went 5-2 with a 1.98 ERA and one complete game in 13 starts. "He took it to the Southern League level and had the numbers he did. He is definitely the lefty of the year, and that's saying something," Berger said. "Miley is deserving." Relief pitcher -- Yonata Ortega, Visalia (13 games), South Bend (35 games): Ortega's 4.10 ERA at Class A wasn't as sparkling as his 1.42 mark in the Cal League, but it's hard to argue with a organization-leading 33 saves, 18 more than Mobile's Dan Stange. "Ortega did a wonderful job," Berger said. "The ERA gets inflated when you have one bad inning, but he was a shutdown guy for us at South Bend. We challenged him and he rose to it." Ortega, a 23-year-old Dominican right-hander, struck out 41 over 41 2/3 innings as a Midwest League All-Star at South Bend before fanning 15 in 12 2/3 frames with Visalia. "In Visalia, he was the go-to guy, he was the designated hammer," Berger said. "They were in a pennant race and it was a huge step for him. We don't like to designate someone as a closer per se, but it was a wink-and-nod -- you show us you're deserving and we'll pave the way for you. He's very deserving. He throws a heavy sinker, fastball up to 95 and the split-finger is unhittable at times."